To this day, the sixteenth-century artistic crisis in the Catholic Church remains choppy water for the art historian to navigate. Some students of the era depict the post-Tridentine Church as micro-managerial to the point of suffocation in artistic matters. Anthony Blunt envisions the artist as “constrained … to keep close to Biblical tradition” and banned from letting “his imagination add ornament.” Rudolf Wittkower, for his part, notes an “almost iconoclastic streak” in the decrees of the Council of Trent. Following this line of thinking, art was reduced to a weapon in the hands of a Church militant, a sort of aesthetic blunderbuss. 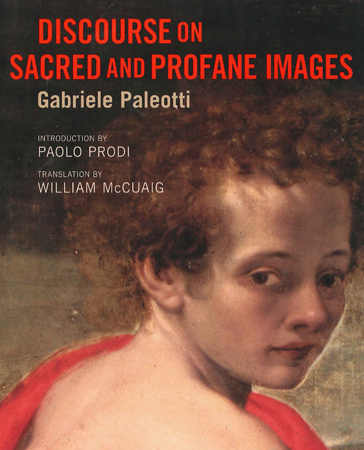 William McCuaig’s translation of Cardinal Gabriele Paleotti’s Discourse on Sacred and Profane Images offers a different perspective on this turbulent age for art. Paleotti, Archbishop of Bologna and one of the Tridentine Fathers, produced this treatise in 1582 with the aim of reviving the fertile collaboration between art and faith that had existed from paleo-Christian times. Aiming at a wide audience, he published in Italian rather than Latin so that artists, patrons, and the lay faithful could understand the meaning and purpose of sacred art and discern the dangers of the profane in art. Originally intended to be articulated in six parts, the final treatise is composed of only two books: the first dealing with the nature of images and the motivation for sacred art, and the second discussing the various types of abuses in art, from heretical to scandalous images. The work closes, however, with a powerful exhortation to greatness. In preparing this text, Paleotti first drew upon his remarkable erudition. His own literary artistry in weaving together Aristotle and the Gospels, Thomas Aquinas and Cicero, Petrarch and the Pentateuch, blazed a trail for the artists he hoped to inspire. His research, however, spilled out of the library and into the streets, crossing disciplinary boundaries along the way. Ulisse Aldrovandi, the renowned naturalist of the University of Bologna, must have provided some of the extraordinary similes from nature, while painter Prospero Fontana contributed practical advice on technique. Paleotti corresponded with Saint Charles Borromeo, who was working on his Instructiones Fabricae et Supellectilis Ecclesiasticae, which was intended to apply the Tridentine decrees to church construction. The participation of prelates, painters, and professors underscores the broad reach of Paleotti’s mission. The book is anything but ecumenical, however. His references to Protestants are quite colorful and invariably disparaging, which may account for its lack of popularity in Anglophone art history. But in Italy, Paleotti has long been a guiding light. Professor Paolo Prodi, who has worked on this text for decades, wrote the lengthy preface, offering the reader a nuanced view of the work. Prodi reprises a long-standing Italian belief that Paleotti’s treatise influenced the Carracci school, which in turn would pervade the entire Baroque era. Ludovico Carracci (student of Prospero Fontana) opened his canvasses towards the spectator, beckoning the contemporary viewer to participate in the historical narrative. Cardinal Paleotti moved to Rome in 1589 and the Carraccis followed soon after. Their school would dominate Rome for the next half century. Prodi, however, along with his publishers, takes the view that Paleotti failed in his attempt to reform the art of painting. Herein lies my one point of dissension from this fascinating text. Paleotti’s work was principally pastoral, aimed at formation. He sought to teach not only artists but also the faithful to understand the importance of images in the life of the Church. He wanted artists to excel and laypeople to demand beauty, just as they were expected to demand respect for the sacraments. This universal call to artists and viewers gave the history of art an unprecedented new direction; it opened a door for women artists like Lavinia Fontana, daughter of Prospero, who was commissioned personally by Paleotti to produce an altarpiece for the Basilica of Saint Paul outside the Walls; and Caravaggio, a still-life painter from Milan, who was emboldened to paint powerful new testimonies to conversion. But most importantly, people learned to love art again as a via pulchritudinous to Truth. Elizabeth Lev is an art historian who teaches, studies and writes in Rome with a special focus on Renaissance and Baroque art. Her most recent book is How Catholic Art Saved the Faith: The Triumph of Beauty and Truth in Counter-Reformation Art.